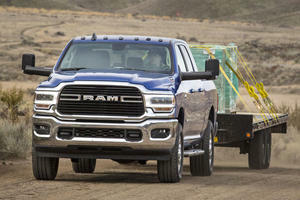 The Ram 2500 has been completely redesigned for 2019 and comes with upgraded powertrains and transmissions as well as much improved comfort and a vast number of customization options. It can be had in six main trim levels and a variety of cab sizes with rear or all-wheel-drive. 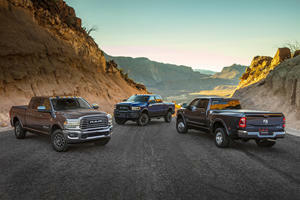 The base Tradesman model in Regular Cab flavor starts at $35,090 including destination charge and offers a 410-horsepower 6.4-liter V8 mated to an eight-speed automatic transmission. 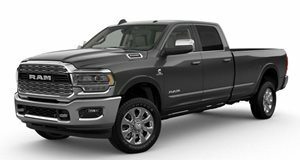 At the other end of the spectrum is the ultra-luxurious Limited model which starts at $64,640 in rear-wheel drive Crew Cab trim and comes standard with a 12-inch infotainment system, power running boards and 20-inch aluminum wheels. 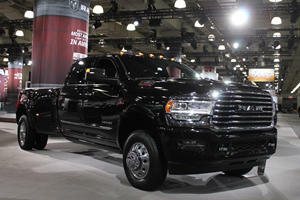 Then there is the extremely capable off-road Power Wagon equipped with a rugged heavy-duty suspension setup. There really is a model to suit every need and aside from the luxury and safety options, the impressive optional 6.7-liter inline-six turbo diesel engine will appeal to those planning to do some heavy towing duties.